On Friday evening, the ingredients came together for a picture-perfect Thanksgiving for many families who might not have been so fortunate. Members of Staten Island's five Rotary clubs – the North Shore, Mid-Island, Gateway, South Shore and Staten Island – gathered in the bottom floor of the Community Resources building to make sure less fortunate borough residents received the necessary items to celebrate the holiday. 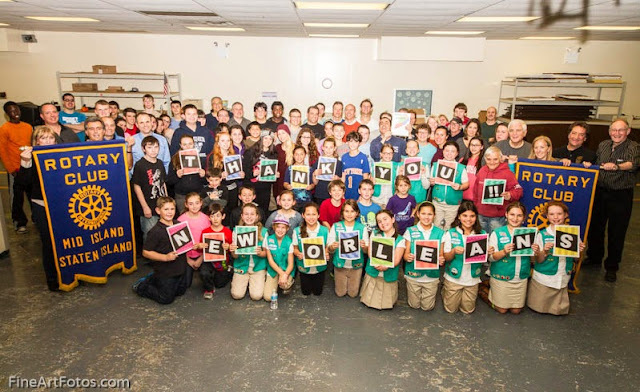 Some 75 Rotary members, plus some helpful teens, formed an assembly line to fill up 984 empty boxes with canned corn and beans, macaroni and cheese, potatoes, stuffing and more. Ten items went into each box, and each box was set up for a Saturday morning delivery that would include a turkey, said Mike D'Angelo, who co-chaired the giveaway with Paul Scamardella, president of the North Shore Rotary. "It's one of the projects all the Rotaries look forward to," said D'Angelo, of Eltingville. "It's amazing what we do here," said Chris Miata, one of the volunteers who was instrumental in piecing each box together. D'Angelo said that the North Shore Rotary started what has become an annual tradition in the late 1970s. 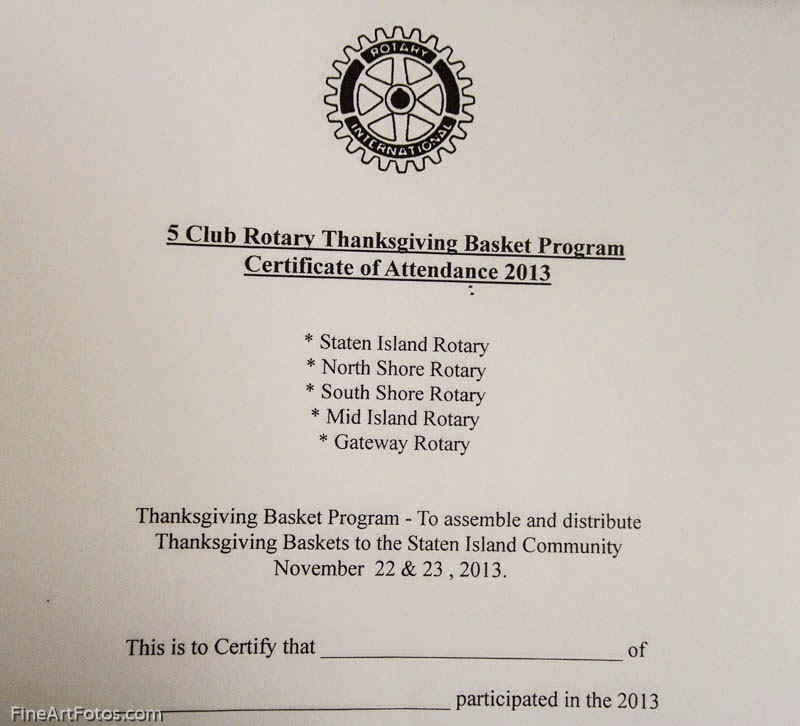 Over the next 10 years, the Rotary Club of Staten Island and the South Shore Rotary Club joined in. By the early 1990s, all five clubs were working together. Approximately $25,000 was raised by the clubs to pay for the food that will go to group homes, churches, shelters and non-profit groups, as well as Staten Islanders in need. Recommendations are submitted by Rotary members, said D'Angelo. "This is what it's all about: Service about self," he said. "It's all about the Island and the community." He said children can learn a great deal from the effort. George Vikos, a former New Dorp High School teacher who still runs the school's Interact Club, sponsored by the Rotary, brought a group of past and present students. A friend of his had contributed once by making a delivery on a Saturday afternoon to a woman who was hoping for a Thanksgiving meal. "She actually held him in a bear hug and wouldn't let him go. That's how happy she was," said Vikos. One of his students, Jeanine Angotti, of Rosebank, a senior at the New Dorp High School, said it feels good to help. "Everybody at some point in their life needs something. You give good, you're going to get good," she said. Ms. Angotti said that people need assistance more now than in the past because of lost jobs and the economic crisis. The boxes were fully packed by 8:30 p.m. and the turkeys arrived 10 hours later, the next morning, to complete the Thanksgiving giveaways, which would be delivered by drivers using trucks donated by numerous Island groups and companies, including Community Resources and the Staten Island Advance. All packages had been delivered by noon on Saturday. "It worked out real nice. We handed out almost a thousand food baskets, which translates to probably four, five or six people getting fed," said D'Angelo. "It's quite an achievement." 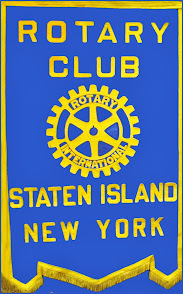 Staten Island has five Rotary groups, all of which have a goal of providing humanitarian service and encouraging high ethical standards in all vocations. The Rotary motto is "Service Above Self." Since its inception in 1962, Staten Island Rotary Foundation (SIRF) has distributed over $1.5 million either in the form of grants to Staten Island organizations, disaster and hardship relief in both the United States and overseas or in scholarships. The Rotary Club of Staten Island sponsors an Interact Club, a service and social club for young people ages 14-18, guiding the teens in developing local and international service projects. Lainie Wilkinson is president of the Rotary Club of Staten Island, which was chartered in 1921. John Caltabiano is president of the South Shore Rotary Club, chartered in 1955. Paul Scamardella is president of the North Shore Rotary Club, chartered in 1957. Ron Mannanice is president of the Mid-Island Rotary Club, chartered in 1990. Rocco Berardi is president of the Gateway Rotary Club, chartered in 1991. More than 900 needy families across Staten Island will have a Thanksgiving dinner with all the trimmings thanks to the Island’s five Rotary clubs. About 150 members of the North Shore, South Shore, Mid-Island, Gateway and Staten Island Rotaries, along with family, friends and local students assisted in yesterday’s event, an annual tradition for about 30 years. Several vehicles, including two Advance trucks, supervised by Circulation manager Richie Salerno, dropped off the 912 dinners to individuals, houses of worship and community organizations. Thirty-one military families also received dinners at Fort Wadsworth. Paul Scamardella, a manager at Cafe Del Mondo in Willowbrook and chair of the event, explained that they were delivering meals for a typical family of four to five people. His co-chair for the event was fellow North Shore Rotary member Michael D’Angelo, a certified public accountant with an office in Great Kills. For about 20 years, the turkeys and trimmings have been supplied by Ranchers Best Wholesale Meat in Port Richmond, and owner John Tesoriero has received the Rotary Paul Harris Fellow Award for supporting the effort. Volunteers spent about two hours on Friday night at Community Resources, Travis, sorting and packing dinners and were there as early as 6:30 a.m. yesterday to load vehicles for delivery. “I like helping out people who aren’t as blessed as I am,” said Chris Pellegrino of Prince’s Bay, a sophomore at the Poly Prep school in Brooklyn, as he lifted boxes of turkeys.